Situated on 9.8 acres, yet only 6 miles from shopping and Liberty University. This custom built ranch style home features two main floor master suites each with it's own in-suite bathroom! There is also a mother-in-law suite/business office with its own separate entrance. 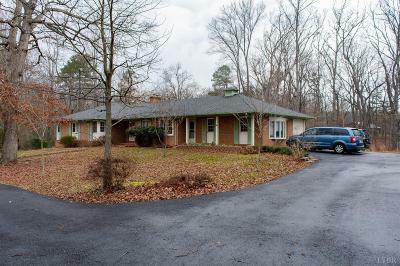 Additional main floor features include hardwood floors throughout, a 14x18 living room with fireplace, generous sized dining room, and a quaint kitchen/breakfast area, totaling approximately 2300 above grade sq. ft. The terrace level is light and bright with windows spanning the 35x24 Ft family room. The additional 1700 finished Sq. Ft. includes: fourth bedroom with attached full bath, office, laundry room, wet bar, FP, and a safe room with plumbing. The acreage is lightly wooded and flat with a cleared area (once a riding ring) adjacent to the 40x40 barn. The primary heat source is forced warm air oil and a secondary source is an exterior wood furnace which feeds into the duct work and water heater.